Book Parties – Join in the Fun! It consists of 15 Dernier titles, 20 bookmarks, 20 leaflets and 4 posters (not shown). This is an exciting development! If you would like to hold a Book Party, please contact us! 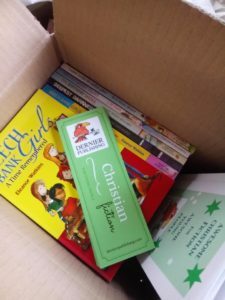 Would you like to see more Christian books in young people’s hands? Do you like getting together with friends and family? It’s a great thing to give church children books that will encourage and inspire them to keep walking with God . . . and to share the good news with others who might otherwise not hear it. At an age when there are so many pressures on our precious young people to conform to the world, books can change lives. Well, the Lord changes lives, but from the testimonies we receive, we know that the Lord is using our books! They are a bit like seeds – who knows what fruit might grow? christianparentingchallenge 11th September 2017 Latest news from Dernier Publishing!